Click image to enlarge Cowlitz River at Castle Rock, Washington. Image taken August 12, 2006. 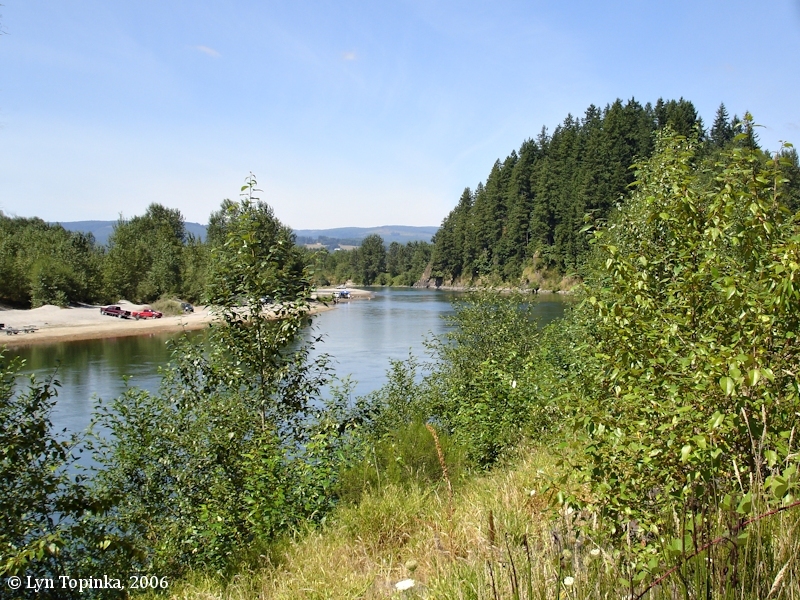 Castle Rock, Washington, is located on the east bank of the Cowlitz River at River Mile (RM) 16. Downstream are the cities of Kelso and Longview, located where the Cowlitz River meets the Columbia. 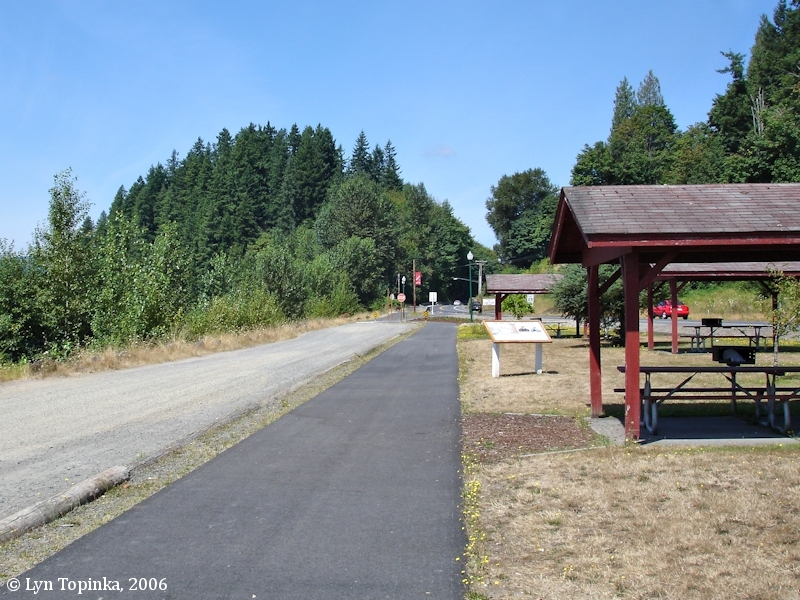 Cowlitz Rock is located at Cowlitz River Mile (RM) 16. The 1929 U.S. Postal Guide lists "Castlerock" as the area's Post Office". 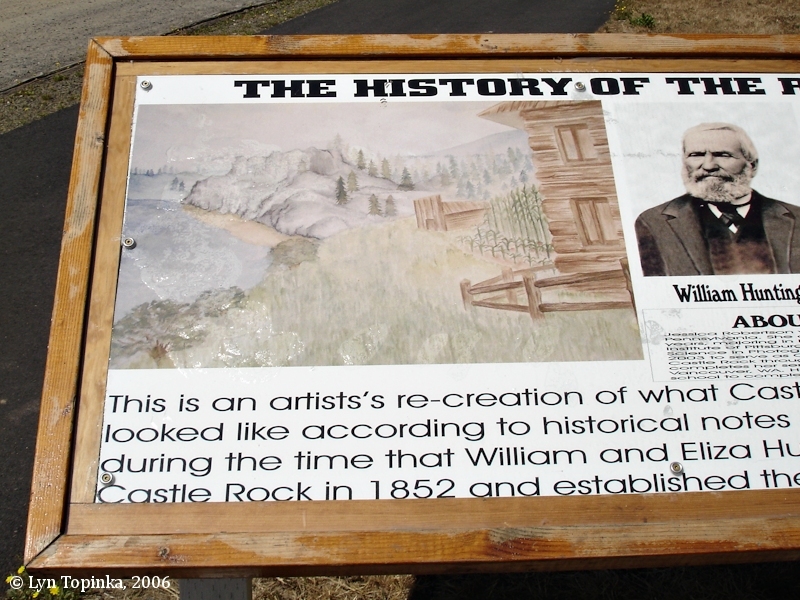 The U.S. Board of Geographic Names made "Castle Rock" official in 1930. 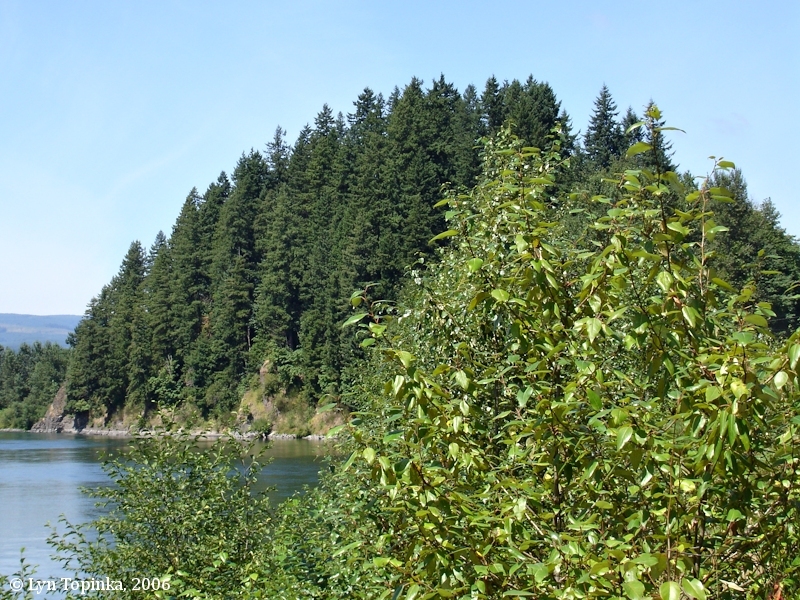 At the turn of the century there were THREE "Castle Rocks" along the Columbia River, with the most famous being the large basalt feature on the Columbia River east of Vancouver now known as Beacon Rock. There also was a Castle Rock in Oregon, located at Columbia River Mile (RM) 262, a small community which existed in the early 1900s. "The Rock" of Castle Rock is a large basaltic feature located at Cowlitz River Mile (RM) 16, an was visible to early travelers of the Cowlitz River. Today it is heavily treed, and a treasured part of community life. The Rock Community Park exists south of the rock, and Riverfront Trail, a bike/hiking path, winds its way around the base. There is a trail to the top. 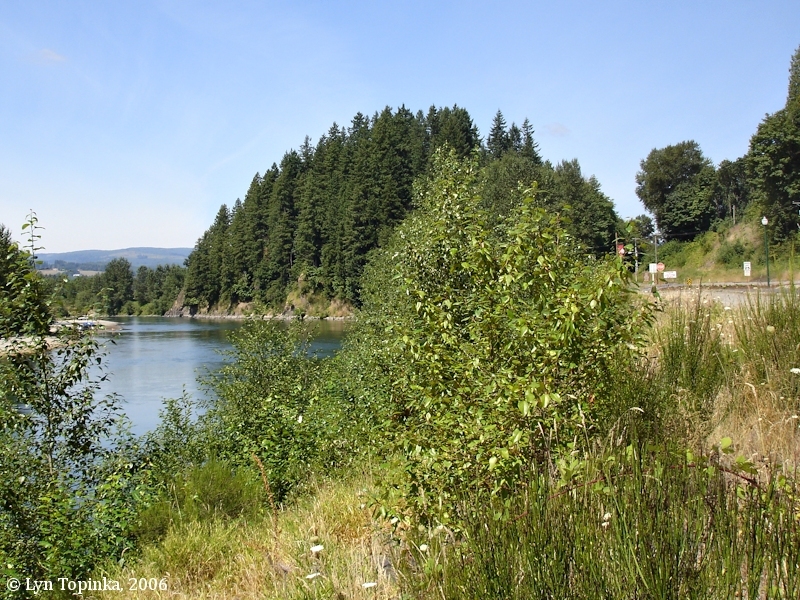 Click image to enlarge Castle Rock and the Cowlitz River, Castle Rock, Washington. View from park south of Castle Rock at The Rock Community Park. Image taken August 12, 2006. 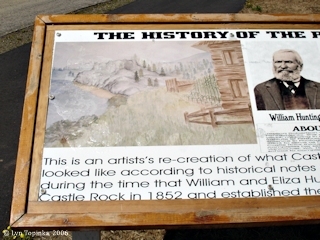 Click image to enlarge Information sign, Castle Rock, Castle Rock, Washington. Image taken August 12, 2006. Click image to enlarge Closeup, information sign, Castle Rock, Castle Rock, Washington. Image taken August 12, 2006. 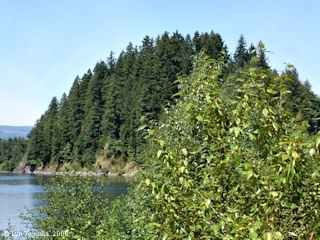 Click image to enlarge Castle Rock as seen from Park, Castle Rock, Washington. View from The Rock Community Park. Image taken August 12, 2006. 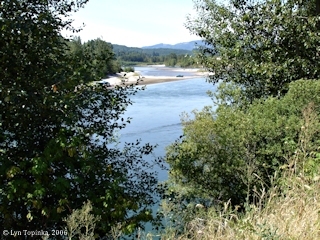 Click image to enlarge Cowlitz River at Castle Rock, Washington. "The Rock" of Castle Rock is on the right. Image taken August 12, 2006. 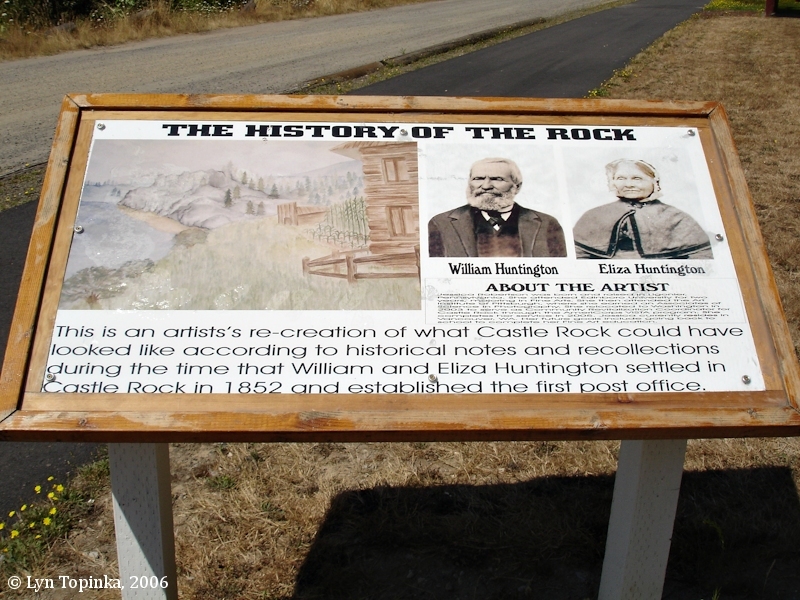 Click image to enlarge "The Rock", Castle Rock, Castle Rock, Washington. Image taken August 12, 2006.